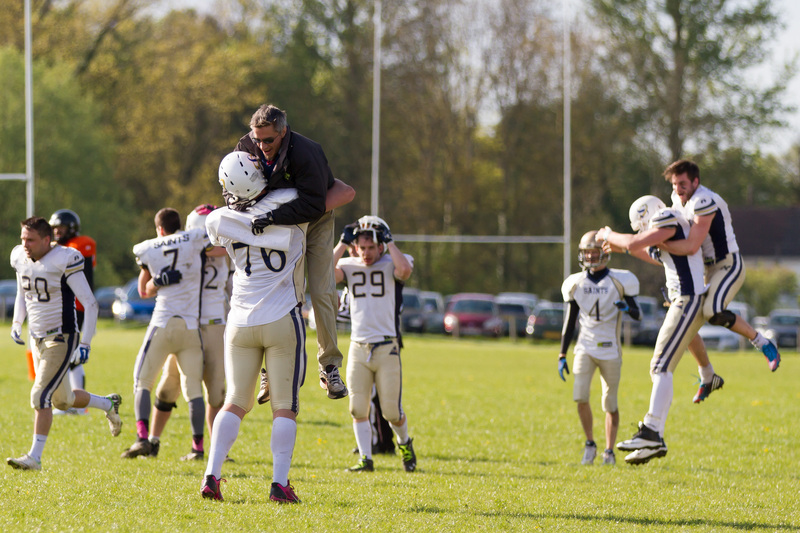 The Oxford Saints bounce back from behind to beat division favourites Bristol 35-34! 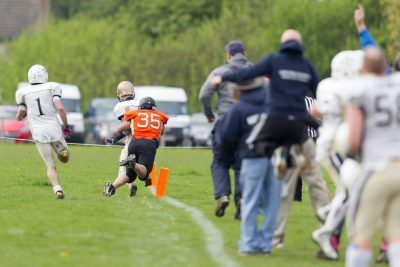 Last weekend the Saints hosted Bristol Apache at the Oxford Rugby Club for the 2nd game of the season. 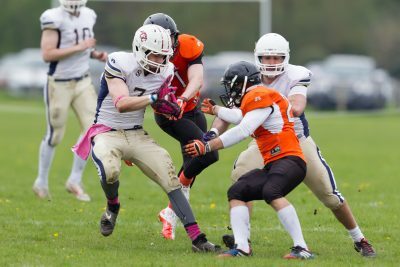 Coming off a 18-6 win over Torbay on 12th April, Oxford were keen to keep the momentum going, whilst the game was Bristol’s first match of their season. At the beginning of the 2015 season, Bristol were widely believed to be the favourites to win out the South West Division with Oxford being close behind. The two teams have played each other many times over the years and each game is often a tough fought contest. The Saints set a new record for themselves by overcoming the largest first half deficit they’ve experienced in over 15 year and still pulled back the win. A special guest from Saints history visited for the occasion. 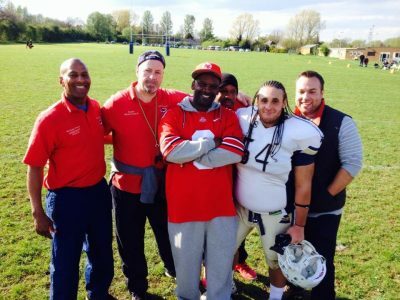 Former coach and player Eric Watts was amongst the team throughout the game providing motiviation and reconnecting with his old brothers. Eric led the pre-game huddle and fired the players up. In front of another large home crowd, the Saints received the opening kickoff and it’s offense took to the field. Up against an experienced Bristol defense, the Saints struggled to make gains and were soon forced to punt the ball away. Oxford knew that the major threat by Bristol would come from their strong passing game. This was made immediately clear when Bristol’s quarterback came out and tested the Oxford defense. After three quick plays, the Bristol quarterback spotted a open receiver in the corner of the endzone and passed the ball quickly to him for the first touchdown of the day. The extra point kick failed, 6-0 Bristol. 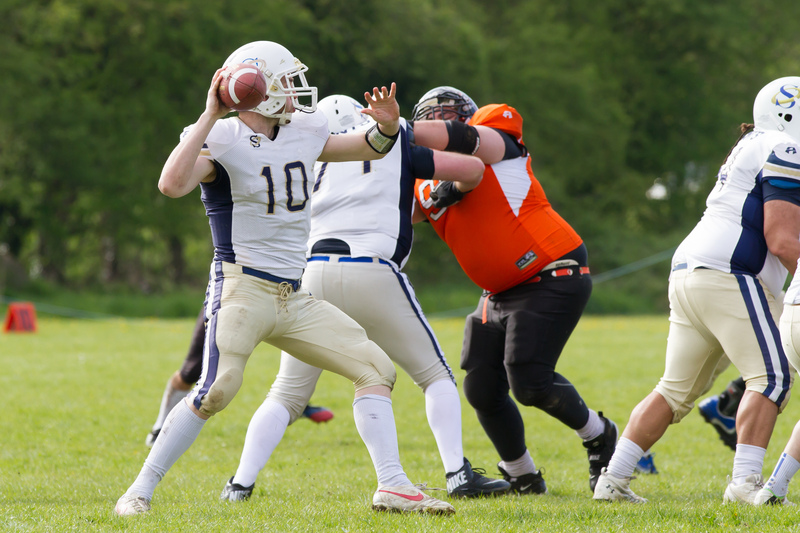 Saints quarterback Ben Denton led the offense back onto the field and worked to even the score. Putting together a brilliant 12 play drive, Oxford marched down the field picking up valuable first downs along the way. As the Saints entered Bristol territory, Denton found receiver Sam Armstrong open across the middle of the field and zipped a perfect pass into his hands. Armstrong used his speed to out run the defenders and sprinted for 33 yards into the endzone for the touchdown. Spencer Duffy attempted the extra point kick but it was deflected by Bristol. 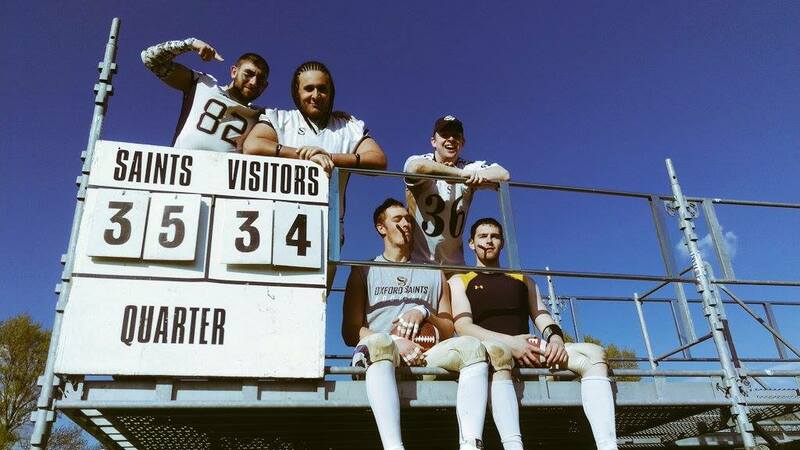 The game was tied 6-6. Veteran Sam Armstrong returned to the Saints this year after an absence and was thrilled to get his first touchdown since being back, in such a critical game. “To open up our scoring was an incredible feeling following a year out with injuries. It was a perfect throw from Ben and a great call from Head Coach Andrew Day, which made my job very easy. Encouraged by the quick comeback, spirits were soon dampened when Bristol put together another quick scoring drive and gained 53 yards on the Saints defense before finding another open receiver in the endzone after just 5 plays. 12-6 Bristol. Oxford’s offense looked to balance the score but struggled to make progress on their next drive and a penalty set them back further, forcing another punt. 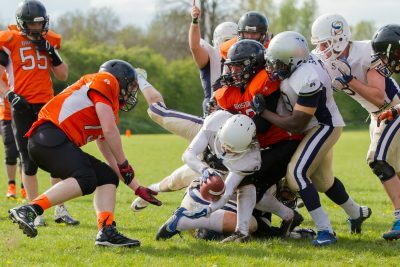 The Bristol passing game continued to wreak havoc and their quarterback threw a quick pass to a receiver who charged up the sideline for 55 yards before being tackled just short of the endzone by an Oxford defender. The defense put on a defiant display and held firm near the goal-line, preventing Bristol from picking up the extra 6 yards they needed to get across the line and add another 6 points onto the scoreboard. The Saints offense took over from the 6 yard line and were desperate to move the ball away from their own territory. On 4th down, Denton attempted a pass which Bristol intercepted, giving their offense great field position. 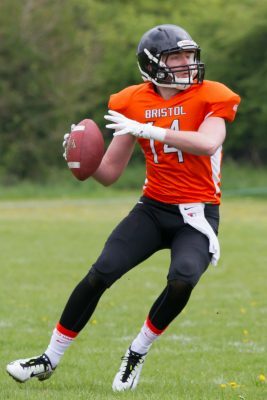 The Bristol quarterback utilised this opportunity and passed the ball for a 16 yard touchdown. The extra point kick was good and the Apache extended the lead 19-6. With the Oxford offense struggling to make meaningful gains and the defense being picked apart by Bristol’s high powered passing game, the Saints outcome was looking grim. 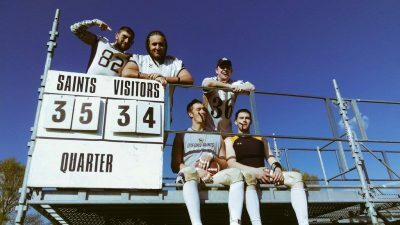 The Apache took advantage of the situation and put another passing touchdown on the scoreboard followed by a 28 yard field goal to end the first half. The Saints were on the wrong side of a 28-6 scoreline and needed a miracle. 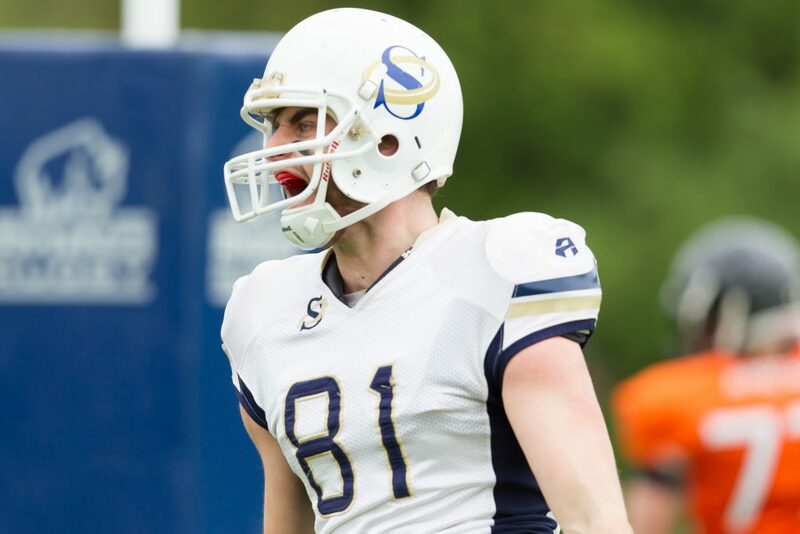 As a frustrated Saints squad took to the sidelines, middle linebacker Graeme Taylor looked to inspire his teammates to not give up and shouted: “I’ve been in deeper holes, on worse teams, against better opposition then this…”. Whilst the supporters went to stock up on refreshments during the break, the Saints coaches worked tirelessly to gauge player feedback and make vital adjustments to the game plan on both offense and defense. Bristol received the ball to open the 2nd half and a determined Saints defense held them to just a single yard of progress before forcing a punt. Ben Denton and the offense came out and looked like a different unit entirely. Critical adjustments made to the offensive line created a much more powerful offense that Bristol struggled to contain. Middle linebacker Dean Bryan, now playing on the offensive line, took on the task of shutting down a key Bristol linebacker who had been causing problems for the Saints offense in the first half. 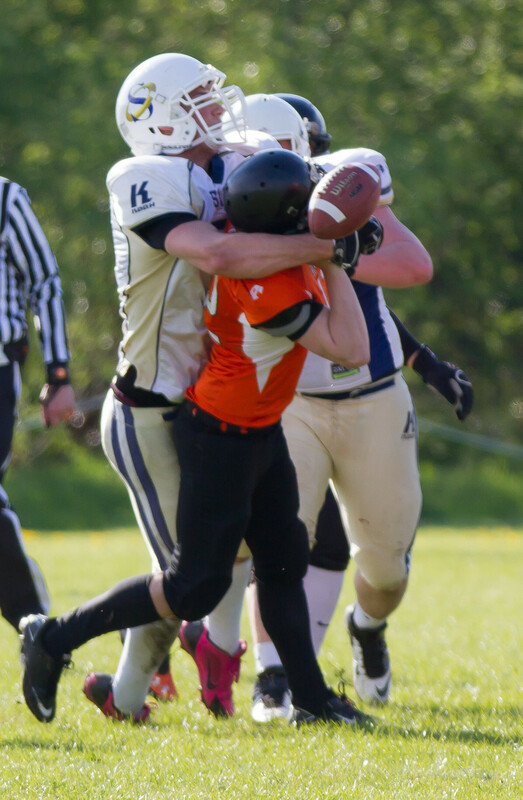 For the remainder of the game, strong dedication by Bryan kept the Bristol warrior out of reach, affording his teammates valuable time to make plays. Oxford marched 78 yards down and a pass by Denton to teammate James Walter gave the Saints a touchdown and a much needed morale boost. The extra point kick by Spencer Duffy was good. 28-13 Bristol. Confidence on the Bristol sideline remained high as they had their backup quarterback out with their offense. In the face of a reinvigorated Saints defense, the Apache quarterback threw a pass which was intercepted by Oxford cornerback Mike Turner who ran it 72 yards all the way to the Bristol end zone, evading his pursuers. Another successful extra point kick by Duffy brought the score to 28-20 Bristol. Following the score, Bristol were given back possession of the ball and within moments another pass was intercepted by Saints safety Michael Bearman! The whole sideline erupted with excitement as Bearman fired up the burners and charged 15 yards into the endzone for a 2nd Saints touchdown within moments of the last one! Defensiveback coach Andy Peart struggled to contain himself and was leaping up and down knowing his unit had tipped the balance and earned two scores from interceptions. Duffy’s solid kicking narrowed the scoreline to just 28-27 Bristol. With Bristol’s starting quarterback on the field once again, he looked to shore up the Apache lead. Despite renewed effort by the Saints defense, he put together a strong 58 yard drive ending with another touchdown pass. The extra point failed and Bristol moved to 34-27. Towards the beginning of the 4th quarter, Oxford’s determined offense marched the length of the field once again. A combination of accurate passes by Denton and strong running by James Walter, Rob Johnson and Kev Brooks brought Oxford within scoring distance. Runningback Kev Brooks dived over the line for the vital score which put the Saints just one point behind Bristol, 34-33. Oxford’s head coach Andrew Day made the call of the game when he instructed the offense to attempt a two point conversion and gain the lead, instead of the extra point kick which would only tie the game. 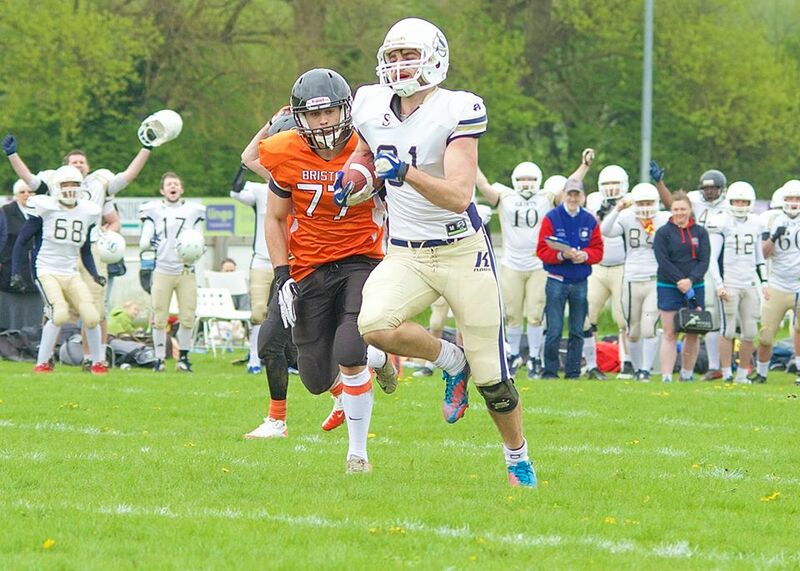 Denton dropped back and his offensive line kept the Bristol defenders away, allowing time for a perfect pass to the towering tight end Rich “Gronkowski” Bloomer, who crossed into the endzone for the score and knocked down an Apache defender at the same time. 35-34 Oxford. 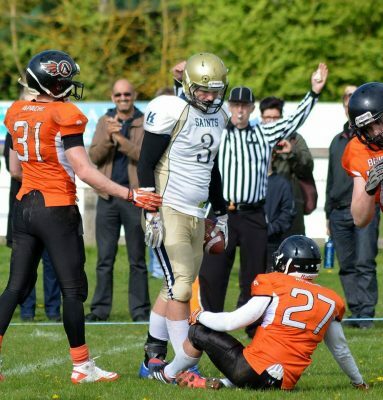 Knowing that he had just secured the lead for the Saints, Bloomer showed excellent sportsmanship and simply helped up the Bristol defender to his feet before departing for the sideline. With Oxford in the lead for the first time of the match, all eyes turned to the Saints defense as it needed to stop any further Bristol scores to seal the game. The remainder of the 4th quarter was extremely tense as both teams hunted for a final score which would tip the game in their favour. 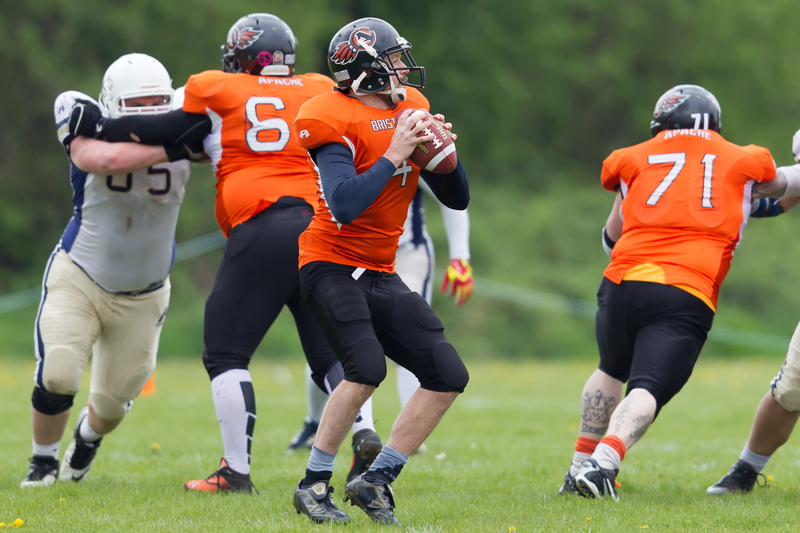 Defensive rookies Connor Day and Conor Whitehouse added huge pressure to the Bristol offense. Defensive ends George Wright and Conor Whitehouse also landed huge sacks on the Apache quarterback which and it was becoming clear that the Saints defense was causing serious problems to Bristol. With just 6 seconds left on the clock, Oxford knew a deep pass attempt from Bristol was coming and just had to stop one more play. As the ball left the quarterbacks arm, everyone on the sideline was on their feet watching it fly through the air. It appeared to be on target and a Bristol receiver looked for the catch but at the last moment it was batted down to the ground by cornerback Mike Turner! With the game officially over, players and staff ran onto the field in celebration accompanied by cheers and applause from the sideline crowd. Oxford had beaten the odds and earned their largest comeback win in over 15 years, whilst beating the division favourites at the same time. Denton had a strong performance in his 2nd regular season game as a quarterback. Overcoming a big first half margin, he held firm and led the Saints offense in a remarkable 2nd half comeback. 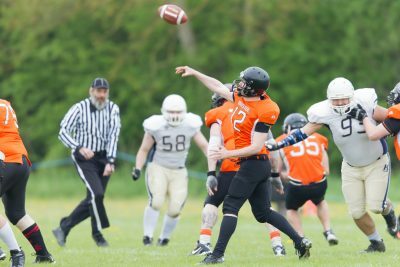 Next up, the Saints are travelling to take on the Swindon Storm on 3rd May! Game preview coming soon.